Gilbert White’s ‘The Natural History of Selborne‘ has been a big inspiration that has influenced my work, practice and interest in nature. It’s great, therefore, to be able let you know that both the prints and cards from ‘A Natural History’ are now being sold by a gallery in the author and naturalist’s home county of Hampshire. 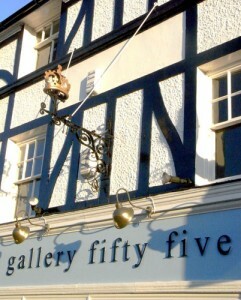 Based in the picturesque village of Hartley Wintney, Gallery Fifty Five, is a new independent gallery that exhibits work from both emerging and established artists. In addition to showing work they also hold artist led workshops and taster sessions. The gallery can be located at High Street, Hartley Wintney, Hook, Hampshire, RG27 8NY. For more information you can visit their website here. This entry was posted in stockists by markgreco. Bookmark the permalink.